The guides below will explain how to create an institutional registration, activate a subscription, and utilize the Administrator page. 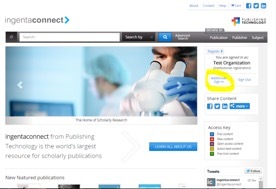 In order to register and activate your journal subscriptions, please go to www.ingentaconnect.com and click on ‘sign up here.’ Select the option for personal registration. Enter your information in the fields provided. Choose a username and password (username/password must be at least 5 characters). Once you have entered in all relevant information, please click on ‘Register’. You can then set up your subscriptions by clicking on ‘Personal Subscriptions’, and then selecting the ‘Add’ tab. 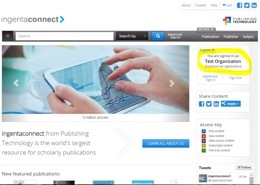 Search for the journal title(s) you subscribe to. You will then receive a confirmation message that your request has been received. An e-mail will then be sent out when access has been set up. In order to access your institutional subscriptions online, you must first complete a simple one-time registration and activation process. This takes no more than a few minutes. Important: If you are already registered with ingentaconnect and want to add a new title or renewing an existing subscription, please sign in with the administrator credentials and start at SECTION B – Step 1b. If you appear to be signed in, this means you have been IP authenticated and your institution already has a registration. In this case, you will need to use the link to Additional Sign In, and sign in using the Administrator login credentials. Please contact help@ingentaconnect.com if you do not know who your administrator is or if you have forgotten your administrator login details. Enter your organizations’ information and your contact details as the administrator. Click Next. Authenticate IP addresses. Access to ingentaconnect can be set up by IP address or by user name and password. You may choose to use one or both of these authentication methods. IP authentication works in a way that will allow users to access institutional subscriptions without needing to login. 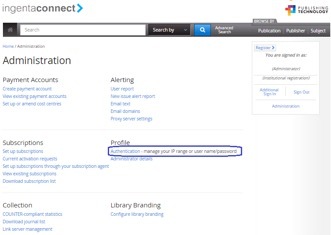 A shared username and password will allow institutional users who are outside a certain IP range to still login and access institutional subscriptions. Check the box(es) next to the authentication method(s) that you would like and click Next. 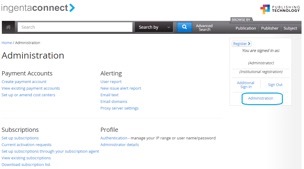 Create an Administrator User ID and Password. Please be sure to choose an administrator username that is transferable should a new administrator take your place (i.e. Fname-Lname is not a transferable username, OrganizationNameAdmin is a more transferable username). Check the box next to I agree to the terms and conditions and click Register. Confirmation. Please take note of your customer ID number. If you would like to update IP authentication for patron access, sign in as the administrator and navigate to the Administration Page.